Pradhan Mantri Suraksha Bima Yojna PMSBY The government has launched a few social security schemes, which are of enormous significance for the masses. 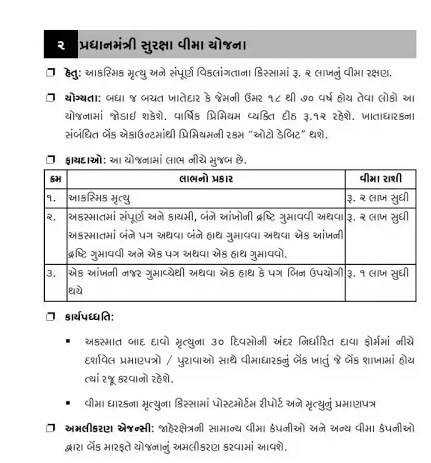 Gujarat State Also Available PMSBY. here update continuesly new, upcoming and currently running scheme and initiatives of central government for various purposes. The list contains all the welfare schemes and initiatives launched by the central government for unemployed, farmers, women, ex-serviceman, central government employees and general public. At a cost of a nominal premium, these schemes ensure comfortable future for many. In the case of sudden death and full discrepancy, Rs. Insurance cover of 2 lacs. People who are 18 to 70 years old of all savings holders Can join in the scheme.The annual premium is “Rs. 12” per person. Related to the account holder The amount of premium from the bank account will be “auto debit”. 1. Accidental Death Up to 2 lakh. 2. Lose the perception of both an entire and permanent, accidental or accidental accident Lose both legs or both hands in an accident or an indictment Lose sight and lose one leg or one hand. Rs. Up to 2 lakh. 3. Loss of an eye catch or a hand or foot non-useful Done Rs. Up to 1 lakh. Claims after the accident, below 30 days of death, in the prescribed Claim Form In the bank branch of the insured bank account with proofs / testimonials / evidence presented You will have to retire postomatom Report and Death Certificate in case of death of insured. Public sector general insurance companies and other insurers The plan will be implemented through the bank.